When providing tests about geography, they mostly cover continents, countries, and capitals. But what about rivers? 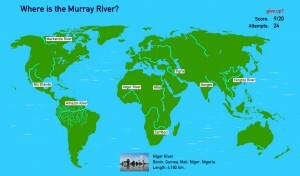 World Geography: Rivers aims to see just how much students know about the majestic rivers that cover our world. The game provides the name of the water body, and it is the student’s task to determine where this river can be found on the map. On choosing the correct location, a very brief information about the river will be shown at the bottom of the screen, and the player earns a point. The player can guess however many times he wishes until he gets the correct location; it should just be noted that the game also records the number of times the player was incorrect. Teams can play only a single instance of this game, where teams take turns in naming rivers and the teacher noting the score; whomever has the most points would win. Alternatively, the teams can play an entire instance (with those not playing having their backs turned to the smartboard). The group with the less number of incorrect answers wins. This entry was posted in Other and tagged geography, k3 by Majorie. Bookmark the permalink.